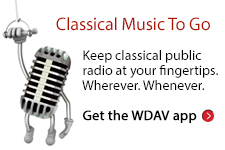 On Tuesday, October 20 in WDAV”s Mozart Café, The American Chamber Players dropped by the WDAV studios to perform selections of Bach and Mozart – and to chat with Frank Dominguez about chamber music. Watch a video excerpt from their visit! Founded in 1985, the has toured throughout North America, and its performances are heard frequently on National Public Radio”s Performance Today. The group features Sara Stern on flute, Joanna Maurer on violin, Miles Hoffman on viola, Alberto Parrini on cello, and Anna Stoytcheva on piano. The American Chamber Players were in town to perform at Davidson College on Tuesday evening, October 20 and at Queens University of Charlotte on Saturday evening, October 24.